Christmas has come early for Michigan’s prized son, Jim Harbaugh. The 52-year old head coach has made it quite clear the past couple years that he will not be attending baseball games without his ol’ leather mitt. Although he has yet to snag a foul ball or dinger since the trend started getting noticed, he held steady this year at the World Series. 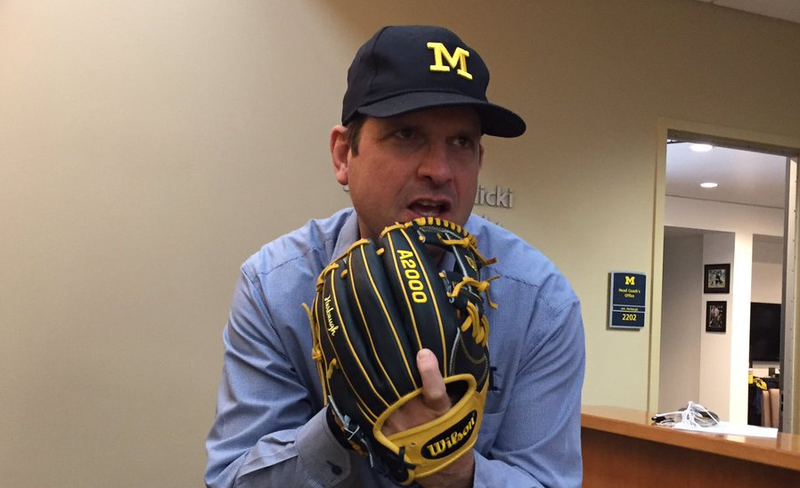 Despite the fact that he landed on the Big Ten’s Naughty list, Michigan softball coach Carol Hutchins found her holiday spirit and hooked Harbaugh up with a custom-made, Wolverine-themed mitt ahead of his team’s clash with Florida State in the Orange Bowl. That tweet was posted just over three hours ago; Harbaugh’s likely already gone home, lathered that sucker up in oil, popped it in the oven, and had a good round of catch. Jim Harbaugh On NFL Rumors: "Lies Made Up By Our Enemies"